A pair of researchers at Flinders University has found evidence that suggests modern kangaroos diversified due to grassland expansion, not drying during the Miocene, as previous studies have shown. In their paper published in the journal Science, Aidan Couzens and Gavin Prideaux describe their study of marsupial tooth specimens that date back 25 million years and what they found. P. David Polly with Indiana University wrote a Perspective piece on the work done by the pair in the same journal issue. 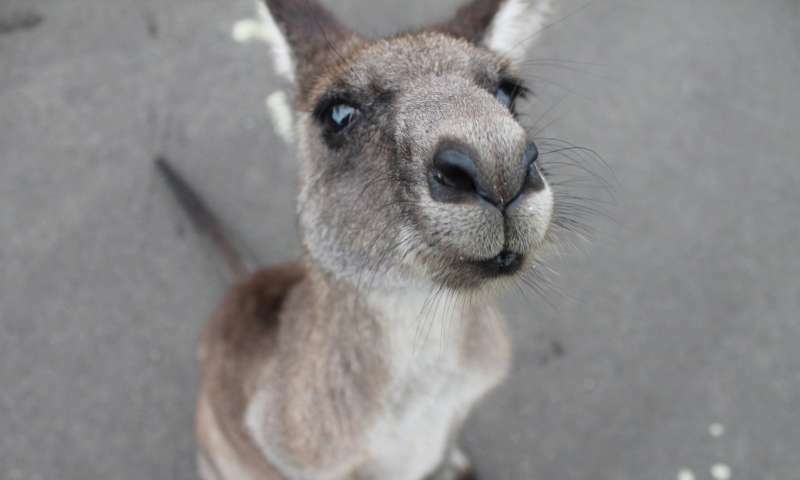 The kangaroo is among the most recognizable animals in the world. It is also unique to Australia and New Guinea, having evolved its unique characteristics in relative isolation. The researchers note that prior studies have shown (using molecular studies) that kangaroos diversified in response to a more arid environment during the Miocene. In this new effort, they offer evidence refuting such findings and suggest diversification came about as a result of grassland expansion during the Pliocene. They have come to this conclusion by studying approximately 1600 marsupial tooth samples ranging from 25 million years ago to today. Prior research has suggested that kangaroo ancestors were tree-dwelling animals who came to live on the ground approximately 20 million years ago. Some of those ancestors grew to become giants weighing over 250 kilograms. Others hung around and eventually evolved to become the creatures we see today. It is still not known why they started hopping. Polly notes that tooth crown size can be used as an effective means of establishing diet—animals that eat rough vegetation need longer teeth to survive. Couzens and Prideaux have used that knowledge to trace the history of marsupial lineage in Australia. By looking at the size of the tooth crown for kangaroo ancestors, they were able to determine what the animals ate. In so doing, they observed that kangaroos had short teeth throughout the Miocene—such teeth are useful for eating tree leaves and shrubs. But they evolved to have teeth with higher crowns, suggesting they had switched to eating tough grasses. But the expansion of tough grasses in Australia did not happen until the beginning of the Pliocene. This suggests that higher crowns evolved approximately 3 to 4 million years ago, not 5 to 12 million years ago as has been believed.